The best way in which to appreciate the history, traditions and atmosphere of Totana is to take a leisurely stroll round its streets. The architecture offers countless wonderful examples of ornamental craftmanship, such as traditional wooden barred doors and wrought iron doorknockers. A simple stroll round Totana also serves to highlight the convictions, beliefs and traditional religious feeling of its residents. These sentiments are best displayed in certain quiet streets, where the inhabitants have built vaulted niches on the outer walls of their homes. These form part of a lengthy tradition and although some have disappeared over time, whilst others have been relocated, there are many which have been preserved and can be visited. 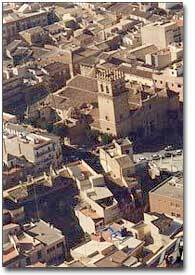 A study carried out by M. García tells us where some of these small 'shrines' can be found: Una Cruz (A Cross) in Avenida De Lorca on the corner of La Jumera. Cruz de Caravaca (Cross of Caravaca) in Raso Andreo. Hornacina de San Felipe (Vaulted niche of Saint Philip) on the corner of San Felipe with Calle Peligros. Hornacina con cuadro de San Agustín (Vaulted niche with a painting of Saint Augustine) in Calle del Pilar. Hornacina Virgen del Carmen (Vaulted niche of the Virgin of Carmen) in Calle de Prietos. Hornacina Animas del Purgatorio (Vaulted niche of Souls in Purgatory) in Calle Animas on the corner of the vestry of Santiago (Saint James). Imagen de San Ramón (Image of Saint Raymond), built of stone, at the residence of the Martínez Aparicio. Niño de la Bola (Child of the 'Bola') on the corner of San Cristóbal. Cristo de Limpias (Christ of the Cleansing) is found where Calle del Carmen and Calle El Paso meet. Capillita del 'Ecce Homo' (Small chapel of 'Ecce Homo') is located in Calle del Paso. San Antonio Abad (Saint Anthony the Abbot): a limestone image of the Saint with a carved wooden piglet at his feet. Las Tres Avemarías (the Three Hail Marys): found in Calle de Juan XXIII and still in very good condition. Santa Rita (Saint Rita) on the corner by the bridge is famous for the popular open-air celebrations which have always been held there on her saint's day. The crosses found on the way into town were built with a view to protecting the population from evils that lurked on the outside, such as disease, plagues and even the devil himself. These symbols of Christian protection were built out of stone in a tremendously austere fashion with no ornamental features, thus forming part of the old canon of traditional art. This cross, which is situated at the entrance to Los Huertos, plays an important part in the famous Cruces de Mayo (Crosses of May) celebrations, during which month it is decorated with flowers by the people of Totana. This round stone ball is found at the start of the path to Los Huertos, on the road which leads to the shrine of La Santa (the Saint). It is here where, according to tradition, on December 8, the civil dignitaries and the people of Totana receive their patron saint, Santa Eulalia de Mérida. On this day, the saint is taken into the parish church of Santiago (Saint James) to the delight of the whole town and great rejoicing takes place, musicians roam the streets, fireworks are let off and canticles are recited. Then, on January 7, people from Totana and the neighbouring villages bid a joyful farewell to the saint and join the famous pilgrimage of La Santa, who is taken to the mountain shrine. Situated in Calle Mayor Sevilla, El Cañico is the former municipal wash house where, before the advent of washing machines, the housewives of Totana would take their washing baskets. It became a focal point of life for the townspeople, and it was there where they gossiped about the lives of their neighbours. It was also a firm favourite amongst the children of Totana and once school was over, they would meet there to play with their friends. This small chapel, in Avenida de Santa Eulalia, houses the Cruz de Viernes Santo (Cross of Good Friday) which the people of Totana only visit at Easter and, in particular on Good Friday, to commemorate the suffering and death of Christ. The statue of Christ was destroyed during the Civil War.